3.8 out of 5 based on 350 bloggers and 89 commenters. 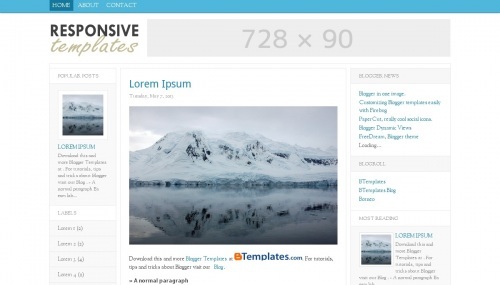 ResponsiveT is a free blogger template adapted from WordPress with 3 columns, responsive design, left and right sidebars, fresh look, minimalist, ads ready, pagination and neutral colors. Excellent template for blogs about any general topic, fashion, photography or travel. Really excellent template and Responsive. I use this template and very happy for responsive. Normally my site is pay loan in Cayman Island. When i view my blog on a mobile, a default mobile template comes, even though i disabled mobile view. i want the blog to appear as desktop view on mobile devices. how do i do that. How i use this template for my blog on blogger? Please tell me. Good template and i use this template in my blog.This template is fix on the tourism. What about Comments ? I don’t see anything about how many comments a post receives..
Really the temlet is excellent and Responsive and very simple. Lot Thanks for sharing. i also want the blog to appear as desktop view on mobile devices. how do i do that. nice template but simple, thank for your template. Very useful template for blog website for business and personal used.And very beautiful design . Responsive theme is a must in 2015 onward, as Google will give priority to mobile friendly websites only. Thank for sharing this great template. its looking good and responsive also. Thanks for the great templates. this template is very good for blog. simple and responsive template. Thnks for sharing this template…..
Really the template is excellent and Responsive and very simple. Lot Thanks for sharing. Responsive web template is best template for responsive web designing, thanks for sharing information with us.